This is a really boring and irritating process, but it doesn't look like there's any option. So, step 1 is to go to this Google page. You need a Google account to do this. If you are not already logged in to yours, or don't have one, you'll need to sign up. If you are logged in you should see something like this. Click the Get a Key button. You should now get a page like this. You probably haven't already created a project for this domain, so select 'Create a Project' and click Continue. Once you've done that you may need to wait for 30 seconds whilst the new project is created - it'll be given the default name 'My Project'. 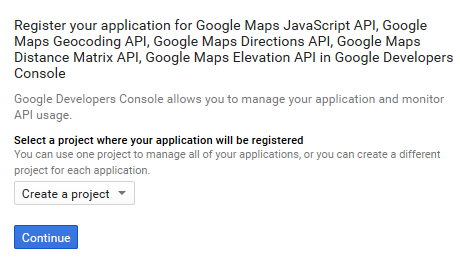 You will hopefully either see the new project in the dropdown list or be redirected to the API Manager page for the project which will look something like this. The API key will have been given the name 'Browser Key 1'. You can change this if you wish, but it's just a label for you. In the lower box, 'Accept requests from these HTTP referrers', you need to enter your domain. You can just enter it in the form www.mydomain.com, but it probably makes sense to enter it this way so that you can use it for any subdomains in the future. Click the Create button and after a second or two you'll see a screen like this. Highlight and copy the key to your clipboard. On the next page, paste the key into the box and click Update. 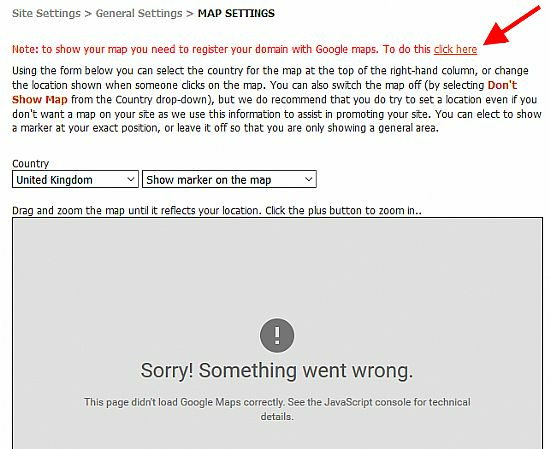 Hopefully now you'll see a map on the 'Location Map Settings' page and all will work as intended.